Japan Embraces Commercial Whaling, Pulls Out Of Global Alliance That Banned It Japan is leaving the International Whaling Commission, which put a moratorium on commercial whaling in the 1980s. The country will allow commercial hunts for the first time in 30 years next July. 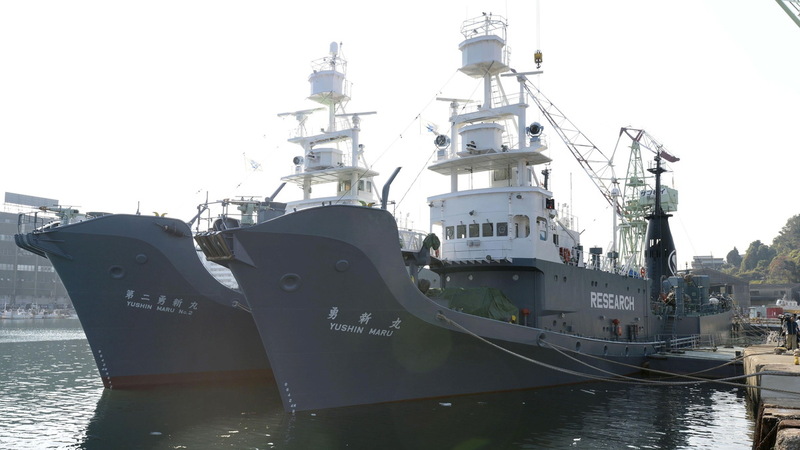 Japan once labeled its whaling vessels with prominent "Research" tags. The country will resume commercial whaling hunts in 2019. Here, the whaling ships Yushin Maru (right) and Yushin Maru No. 2 are seen before leaving for the Antarctic Ocean for a whale hunt in 2015. In the future, Japanese whaling ships will not operate in the Antarctic. "Japan argues that it has a long tradition of whaling, even though Japanese today eat very little whale meat," NPR's Anthony Kuhn reports from Tokyo. After the withdrawal becomes official on June 30, "Japan will conduct commercial whaling within Japan's territorial sea and its exclusive economic zone," said Japanese Chief Cabinet Secretary Yoshihide Suga. News of Japan's plan to exit the IWC first emerged last week. Suga made the move official on Wednesday, saying the commission is focused only on banning whaling, not on regulating the practice to ensure sustainable whale populations. Suga said that "although scientific evidence has confirmed that certain whale species/stocks of whales are abundant," anti-whaling countries remain focused "exclusively on the protection of whales." Criticizing Japan's plan, Humane Society International said that while it welcomes the end of whaling in the Antarctic and other areas in southern waters, the group believes "Japan's decision to leave the rules-based order of the IWC will place its North Pacific whaling program completely outside the bounds of international law." The Humane Society also said it's concerned that Japan's withdrawal could lead other IWC members to follow suit — possibly reviving the whaling industry and posing renewed threats to humpback, fin and other protected whales. Suga said Japan has lost patience with the IWC, citing a lapsed 1990 deadline to modify its whaling moratorium. After Japan's request to adapt the ban fell on deaf ears at the IWC's meeting in September, Suga said, "it unveiled the fact that it is not possible in the IWC even to seek the coexistence of States with different views." Greenpeace Japan Executive Director Sam Annesley accused Japan's government of "trying to sneak in this announcement at the end of year" to avoid international scrutiny. He added that whales and other ocean animals are struggling to cope with a variety of man-made problems, from plastic pollution to over-fishing. "As a result of modern fleet technology, over-fishing in both Japanese coastal waters and high seas areas has led to the depletion of many whale species," Annesley said. "Most whale populations have not yet been recovered, including larger whales such as blue whales, fin whales and sei whales." Critics say it's long past time for commercial whaling to end. In recent years, Japan was often accused of using the guise of "scientific research" as an ethical and legal cover for its hunting trips to Antarctica.